"I always do the right thing, Al. And where does it get me?" Season three is when the formula started to wear thin a bit, and I got a little tired of "Oh, boy," even though Scott Bakula valiantly did his level best to make it sound different every single time. Al hitting his hand link also got a little old. It was also pretty obvious by this point that God has a sick sense of humor. The way Sam is dumped into ridiculous and/or dangerous situations with no knowledge of what is going on is like an ongoing practical joke. Why would God leap Sam into a magic box being pierced by swords, or just in time to sprinkle talc on a naked guy's underwear? Just like season two, the best episodes of season three are the premiere and the finale. In fact, the premiere is considered to be the best episode of the series, because Sam finally got to leap home. Sort of. 3.1 The Leap Home, Part 1 (November 25, 1969): How many of us would give nearly everything for a chance to go back in time and fix what went wrong in our own lives? It's tragic that when Sam leaped into himself at sixteen, he longed to save everyone in his family, but had to face the fact that it was not what God sent him there to do. In a way, "The Leap Home" paralleled "M.I.A." where Al refused to believe Ziggy's projections because he wanted the leap to be about saving his marriage to Beth. Here, Sam also refused to believe what Al was telling him because he was certain he was there to save his brother from dying in Vietnam, his father from dying of lung cancer, and that he could keep his little sister Katie from ruining her life by marrying an abusive man. It's so easy for the audience to put themselves in Sam's shoes. I confess that I've often fantasized about going back in time somehow so that I could find a way to save my sister's life. But no, you really can't go home again. With the possible exception of Al dancing with Beth in "M.I.A.," "The Leap Home" gave us the strongest scene in the series as Sam told his little sister Katie the truth about time travel and the bad stuff that was coming, and tried to prove it by singing his favorite song that hadn't been written yet. 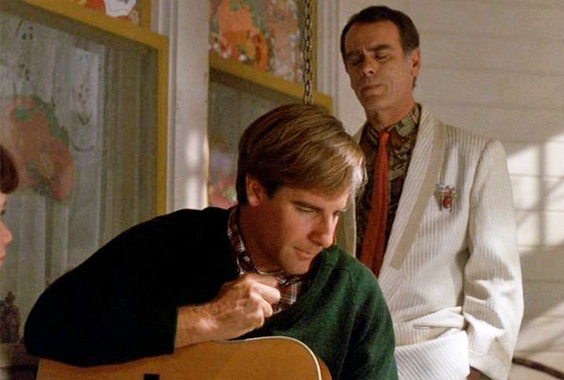 (A beautiful vocal by Scott Bakula, and coincidentally by the way, "Imagine" is my favorite song of all time, too.) Katie's face as she slowly realized that she'd never heard the song before and that it meant their brother Tom would die was genuinely heartbreaking, and Sam was forced to say that he was making it all up. This scene was made even more poignant, if that's possible, by Al almost wordlessly telling Sam not to share with Katie what happened to John Lennon. Honestly, I'm dripping tears just writing about it. In the scenes that followed, Sam for the first time expressed his anger at what God was forcing him to do, to save other people but not the people that Sam himself loved. Al, who had also lost his chance to fix his life with time travel, was the one to remind Sam that God also gave him an amazing gift: the chance to spend Thanksgiving with his family one more time. Scott Bakula played both Sam and Sam's father. That was okay, but it felt too much like a gimmick. I wonder if maybe some of the scenes might have worked better if I hadn't been distracted by Bakula playing two roles? That's a nitpick, though. This is an excellent, emotionally resonant episode. 3.2 The Leap Home, Part 2 (April 7, 1970): Part two was also terrific. It felt like God was rewarding Sam for his sacrifice in part one by allowing him to save Tom's life. Andrea Thompson (Babylon 5) gave a good performance as dynamic reporter Maggie Dawson, who died for her Pulitzer. It made me think about whether or not it would be worth dying to create something that would live forever. 3.6 Miss Deep South (June 7, 1958): I dislike pretty much everything about beauty pageants, but couldn't help loving this episode. Maybe I really liked the feminist slant, that Sam had to perform well in the pageant so that the young woman he'd leaped into could become a doctor and save a whole lot of lives – or maybe it was that he was also there to save another young woman from making an epically bad choice in life, like his sister Katie. Okay, okay, it was probably Scott Bakula singing "Great Balls of Fire" while dressed like Carmen Miranda. 3.12 8 1/2 Months (November 15, 1955): Another excellent episode where Scott Bakula played a woman, this time an unmarried, pregnant sixteen-year-old girl. I particularly liked the emphasis on how helpless an underage pregnant girl was and how few choices she had back in the fifties. I also want to mention again what a strong actor Scott Bakula is. He's a masculine-looking guy, but he can wear women's clothing, even flowery maternity clothes, and I'm still focused on his performance instead of what he's wearing. 3.13 Future Boy (October 6, 1957): Sam leaped in to help Moe, the star of a children's TV show about time travel. Moe constructed a faux time machine in his own basement, and his adult daughter Irene believed that Moe was losing his marbles and wanted to have him committed. Touchingly, Moe built the machine because what he wanted more than anything was to go back in time and be a better husband and father. I don't know whether or not it was intentional, but there was some ambiguity in this Moe situation, since it was pretty clear to me that Moe really had lost touch with reality and should have been hospitalized. But it was still touching that Sam was able to bring Moe and Irene back together as family. 3.22 Shock Theater (October 3, 1954): As I've mentioned before, many Quantum Leap episodes feel like homages to specific movies. Here, it was One Flew Over the Cuckoo's Nest as Sam was subjected to shock treatment against his will, which made him dissociate into various personalities. The best part was that all of those personalities were the real people that Sam leaped into, and that this time, Sam wasn't faking it – he actually was his leapees: Tom Stratton, Jesse Tyler, Samantha Stormer, Jimmy, Kid Cody. Nearly every episode of Quantum Leap puts Sam in some sort of danger, but we usually feel that he'll be okay in the end. In this one, it felt like things were spiraling out of control as Sam suffered abuse and was in genuine peril. In the end, Sam was forced to ask for the shock treatment he dreaded, and he and Al somehow wound up leaping together, leaving us with a pretty serious and unusual cliffhanger. Okay, there were a couple of problems with this one. Al rapping to teach Scott Lawrence's character to read made me uncomfortable. It was also hard not to wonder what happened to Sam's unfortunate leapee after the treatment, and how unfair that whole thing was to him. 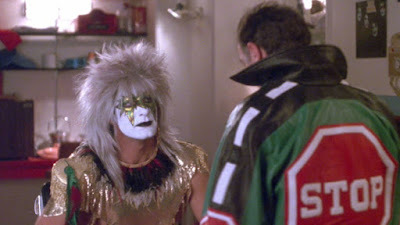 3.17 Glitter Rock (April 12, 1974): It's always fun when an episode features Scott Bakula singing, and for some reason, I absolutely loved the technicolor pseudo-Kiss makeup. But what the hell was Al wearing? A decorative stop sign? Wouldn't that be dangerous if he were walking down a road somewhere? 3.18 A Hunting Will We Go (June 18, 1976): It's hard to pull off this much slapstick in a single episode and do it well, but I thought they did: this episode was pretty darned funny. Good job by Scott Bakula as well as Jane Sibbett, who gave a vibrant performance; I always saw her as David Schwimmer's bland ex-wife on Friends, and didn't realize she was capable of stuff like this. I also appreciated the homage to the famous Clark Gable/Claudette Colbert hitchhiking scene from It Happened One Night. 3.5 The Boogieman (October 31, 1964): This truly idiotic and poorly written episode is about a dream Sam had, while unconscious, of mysterious murders at a Halloween spook house. It included a replica of Al as the devil trying to stop Sam from fixing things while leaping – possibly Dean Stockwell's poorest performance of the series – and a teenage Stephen King with his dog Cujo. — Famous people: Jack Kerouac, and as mentioned above, Stephen King. — Notable actors: C.C.H. Pounder, Kurt Fuller, and Peter Noone from Herman's Hermits. And Olivia Burnett, who did such a terrific job playing Sam's little sister Katie, also played another little girl named Susan in season two's "Another Mother." — Here's a question for those of you better at this online app stuff. Is Quantum Leap available for free at nbc.com (with commercials)? If it is, what did they do about the music replacement issue? I thought season three was good, but not quite as good as season two. And in fact, rewatching season three drove home for me that as a series, Quantum Leap was episodic, not serial. Honestly, I'd forgotten. But as my mother used to say, it is what it is. I'm going to have to disagree with you, Billie, about one episode of this season. 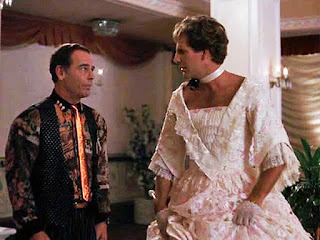 When I think of Quantum Leap, a few favorite moments come to mind. Anytime Sam is pregnant or in a dress, anytime he leaps into his own life, any musical eps, and the one with Stevie King. I loved that one. I was younger at the time, but I thought that it was scary and well done. I haven't seen it in years, of course, but my younger self remembers it fondly. Valerie Mahaffey was in it and she was great. Have you ever seen her guest role on Wings as Joe's stalker lady? So funny. You're probably right, a lot of things that I liked as a kid do not seem so great now. I watched "The Day After" again, having not seen it since the 80's and it was a lot worse than I remembered it. The nuclear destruction scenes were still horrible, but the 80's hair and the acting talents of Steve Guttenberg made it seem really weird. On the other hand, Legion Ep 3 was really scary. I jumped and yelled pretty loudly at one point. 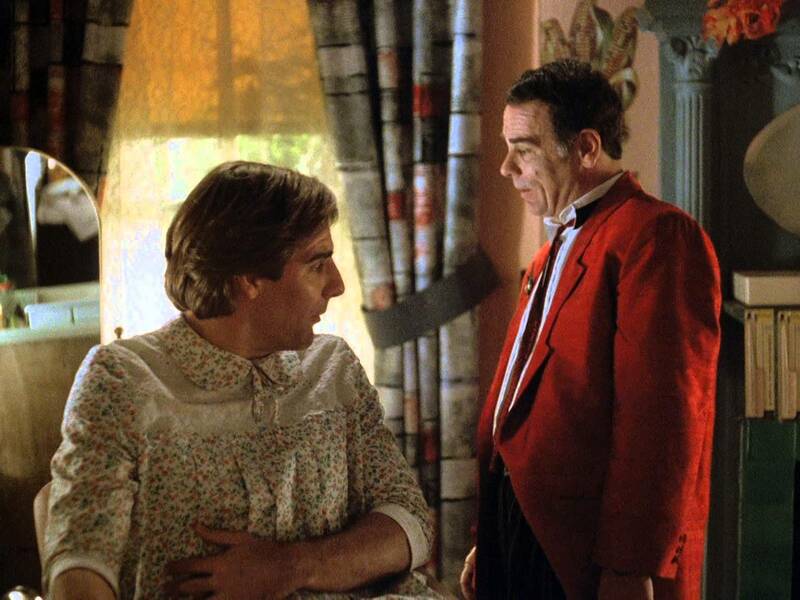 I love episodic TV, it's one of the things I love about Quantum Leap - the way you can just dip in and out of it. Not that I have anything against serial storytelling, but most of my favourite shows are either completely serialised novel adaptations (with a firm, pre-determined end point) or episodic shows with lots of different stories from week to week. Nbc includes commercials but with the correct music. The Reverend, thanks so much for that info about the NBC version. Although it was handy to get a lot of the episodes from Hulu without commercials, I ended up buying the series finale from Amazon because I wanted the original music.